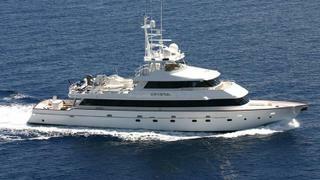 The 34.14 metre motor yacht Crystal, listed for sale by Neal Esterly at Fraser, has been sold in an in-house deal. Crystal was built in steel and aluminium by US yard Deep Sea Marine to a design by Jay Peacock and delivered in 1987 with refits in 1993, 1998, 2001, 2006 and 2014, and has flexible accommodation for 12 guests in six cabins and seven crew in four cabins. Guest accommodation is laid out as a master suite, two doubles and three twins and all cabins have entertainment centres, Samsung LED television screens and en suite bathroom facilities. A large main saloon offers comfortable seating, cabinetry in solid mahogany and walnut woods, an electric fireplace and an entertainment centre including a 65-inch Samsung LED television screen on a rise and fall mechanism and a Kaleidescape on-demand audio and video system. Forward is a recently installed wet bar area with four stools. A very large deck area is ideally suited to handle the stowage of large tenders or the tenders can be removed to create a large entertainment area under sail shaped canvas covers. All in all, she has excellent fishing, diving and cruising capabilities, while offering a luxuriously comfortable interior. Her top speed is 16 knots and she boasts a maximum cruising range of 5,000 nautical miles at 13 knots with power coming from two 825hp Caterpillar 3412-TA diesel engines.